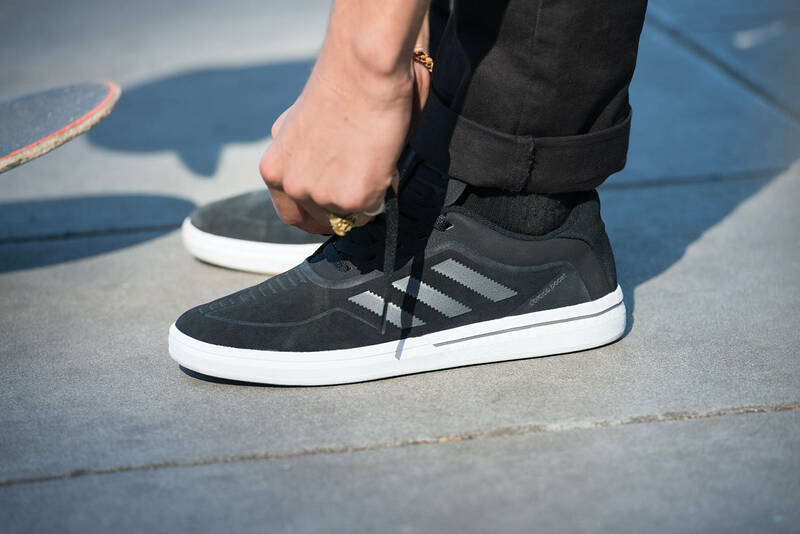 “adidas Skateboarding announces the adidas Dorado ADV BoostTM—the brand’s most innovative skateboard shoe to date. Built from the tooling of its predecessor, the ADV Boost (released in a limited quantity earlier this year), the Dorado ADV Boost offers exceptional step-in comfort, energy return and unmatched protection to a sleek soccer-inspired upper with a modern twist. Utilizing adidas’ game-changing Boost cushioning technology, the Dorado ADV Boost features a midsole partially comprised of thousands of energy capsules that outperforms traditional EVA material. The result is a skateboard shoe engineered for maximum energy return upon impact and superior shock absorption without packing out. The Dorado ADV Boost features premium details and color accents to its stylish, classic suede upper complete with a TPU overlay for abrasion resistance. A mesh internal bootie provides next-level support and fit for high-impact skateboarding and the cool-wearing breathability of SPRINTSKIN provides light-weight ventilation for long sessions in the heat. An articulated tongue stays secure around the foot while the Vector Traction outsole lends a durable grip and heightened board control. HUF teams up with NYC-based skate crew and hardware brand Bronze 56k on a collab and video featuring Josh Wilson, Kevin Tierney and Richie Rizzo. With a heavy line and combos for days, JP Souza comes through with the newest Thunder Knows video clip.